Swaging machines consist of a clamping head and a cylinder operated swaging slide, which houses carbide dies for extended tool life. The hydraulic circuit is internationally designed and the power consumption is very less. 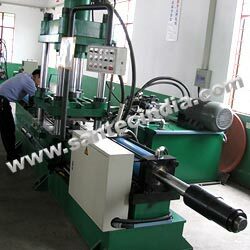 All the hydraulic and electrical components of the swaging machine are of internationally reputed make. The machine uses a PLC control. This machine controls it can handle a variety of jobs such as involving reduction, expansion, beading, cone/cup formation, etc. The hydraulic circuit is internationally designed & consumption of power is very less. All the hydrualic & electrical components are of internationally reputed make.